The super-slim towers featured in this exhibit are a different sort of skyscraper-not unprecedented, but definitely a new formula for development. While they are tall, they are not defined as much by their vertical height as by their slenderness. There are six projects detailed in the show that fit our criteria of slenderness. There are another six at least that are on the drawing boards or have permits filed, but which we could not include because the developers declined to participate. Many of these projects are working their way through a sensitive public-review process with community boards and City agencies. Others await financing to advance. 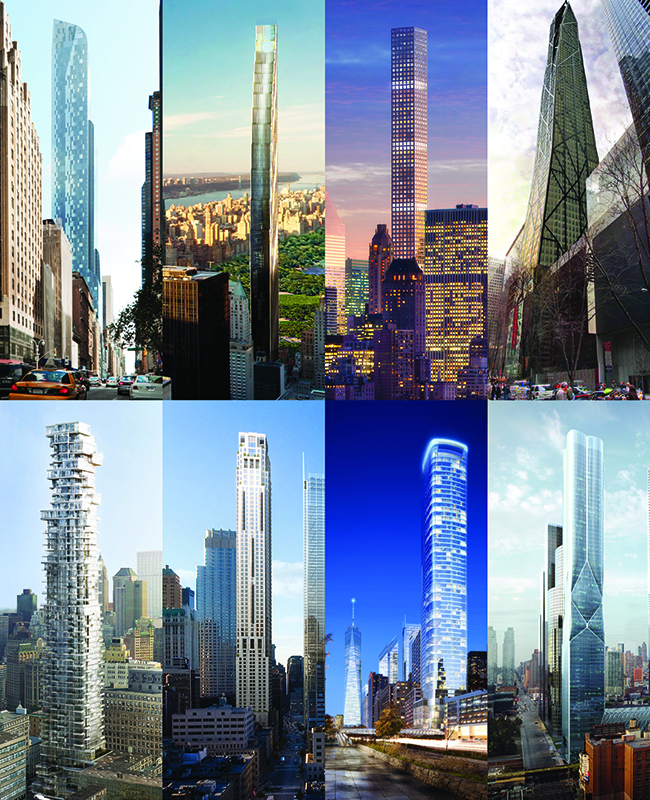 The towers, ordered by their geographies include: on the corridor of 57th Street - One57; 432 Park Avenue; and 111 W. 57th, a project recently redesigned by SHoP for a tower of c.1,300 ft. that will have an extraordinary slenderness ratio of 1:23. The MoMA Tower designed by Jean Nouvel that had won City permission for a reduced height of 1,050 ft., would have been an important example on our walls, but the developer declined to participate. Downtown, 56 Leonard is under construction and the Four Seasons at 30 Park Place is again moving forward after plans were halted by the 2008 banking crisis. In September, another downtown project, 50 West Street, revived from a recession-induced hiatus, became a late addition to our walls. In Midtown West, Hudson Yards Tower D was another late addition. Although it is a bit zaftig for our slenderness criterion, because it is 70 stories and 870 feet tall, and especially because of its innovative cinched-waist form, we included the all-residential tower in our group.